In the image on the right, do you see the 4E? So how does the above Tarot CARD X help us open many doors (3 perhaps, or can we get past the fourth in the north?) with these next two keys? The solfrege frequency 528 hertz is part of this design too, that will be revealed by its connection to Marko Rodin VBM and Nassim Haramein's work too. At the end of the day, I try to place everybody on the same page. It resembles the Sator Square. Here is a peek of what I mean. But do not get lost there yet, in how I merged the 2000 year old Sator Square to modern string theory, called 'M' theory. I need to provide some basics regarding xyz and w first. However you need to be taught how to walk and talk like an Egyptian again first and foremost, left brain linear thinking alone will not get you through the zig zag course. I take the letter E which was attributed to the Temple of Apollo @ Delphi, and I show you how I can take an ancient 'E' theory and with one 90 degree rotation representing 2000+ years, a passage of tiME, the E becomes an m or M.
Thus if we can merge E theory to M theory, does it suggest that we are on a treadmill not realizing we are reinventing the WhEEL, with the passage of zodiacal tiME? Can we find those 4 Evangelists i.e. 11 2 5 8 on the KEYS? Note that MAN 11 is the stem. Note they are the thr3E tE3th of the KEY. that on the stem of that same KEY are the zodiac signs for the following. In those numbers, I see a formula that has confused the best of physicists. The coincidences can only be explained as out of this world? Pauli died in that room on 15 December 1958. WOW that is rather amazing too. First Rm 137 and the day of his death December 15 OR 1215. WOW or 1215 is also known as the following. WOW now we intersect with Marko Rodin's Vortex Based Math. Thus the fact Wolfgang Pauli also had a strange effect named after him, "the Pauli Effect", along with him dying in room 137, on the day of ABAH/BAHA suggests he was part god. Do you see the numb3rs 1 2 5 1 1 2 5 1 in the above text/weave/fret pattern? I have gone so deep down the hole...I have a real good idea what is to be found. I will enter the hole, emerge, and find that on the other side I am now on top of a mountain. NOW would bE a good tiME to plant a fEW sEEds. Those are the KEYs you will need and the treasure map CARD X. Are you ready to enter the world of the 3 Replicators? What are the 3 Replicators? First Richard Dawkins let the memory of pandora escape once again by making some profound conclusions through observing NATURE. In his book the Selfish Gene, he resurrected a term called memes to show how humans evolved culturally through imitation, the passing on of ideas, represented by the term 'memes. Then another scientist/researcher open minded individual came along, Susan Blackmore, and she added yet another layer to the genes and memes called temes. And it is this basic UNIVERSAL MODEL of the primal egg or the 0 plus 3 levels of replicators that we can default to time and again. What can we learn from this 4 AGES/ABC transcription MODEL by using those KEYs? Are you ready to enter the black hole that is YOU? And I would be lying to all of you if I said the Hands of God have nothing to do with the bluehole you are about to enter. 12,000 years of Good Luck is with you. 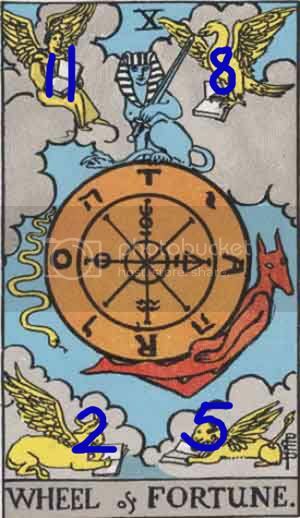 This KEY can be found in the book classic called Tarot of the Bohemians. In reading a review about this book, the last line rang my bell. "Experience has shown us that anything can be fearlessly said. Only those who should understand will understand; the others will accuse our work of being obscure and incomprehensible." Such does Papus describe his literary style... and it IS virtually incomprehensible! But for those who understand the work, by stopping to think about what is being said, and by contemplating the Qaballistic correspondences with IEVE which the author proposes, one can glean from this book several truths. However I don't recommend it to beginners. Moreover, whoever reads it should bear in mind that 1) they have to make a choice between the "Martinist" or French Qaballistic correspondences Papus gives, and the Golden Dawn correspondences. 2) they have to keep in mind that Papus is now outdated in such areas as philology (when he mentions the Hebrew alphabet)... thus I suggest this book only to the well-read on the topic... as it may be confusing. However, I repeat that this book has given me much to think about ... so many questions have arisen since I read the book, about IEVE in nature etc. etc. If you feel up to it... read it! in that formula IEVE I see an I and two E and a V.
which is rather interesting because now we have an E which can be an M and we have an N too. One fella raps about life using his art and the other MNM man raps about symbols that represent the dance between life and art.